Since it's Monday morning, and I'm not ready for the weekend to be over, how about a mini- rant, with my list of things that must go. 1. Too much information on voicemail directions. You know when you call someone, it goes to voicemail, and then the robotic voice spends half your lifetime explaining your options to you, as if there are so many more wonderful choices besides just leaving a message? Here's what I'm talking about: "Bing Bong... I'm sorry but Blah Dee Blah is not available. At the tone, please record your message. When you have finished recording your message, you may hang up or press pound for more options. If you feel so inclined, press two to repeat instructions. Press three to hear these instructions in Espanol. Press four to hear me sing the National Anthem. If you do not press four, you are downright unAmerican, and we will sic Hannity on you. Press five for an over-the-phone confessional with Father O'Harris. Press zero for an operator. But the operator is just me, and I will simply repeat these instructions. Have a nice day." It's not like leaving a message is a brand new concept, that only hip high school kids will understand. Voicemail is older than the internet. Seriously, if I don't hear someone answer my phone call, I promise I will just assume that person is unavailable. Not only that, I will also assume leaving a message is possible. So please, just give me the bleeeeepin' beeeeeeep already! Arrrrrrgh! 2. Celebrity "News" that in no way resembles "News". For instance: Did you hear the news? Zoe's in a leather dress! In my opinion, unless she personally hunted down the animal who provided the leather for the dress, and killed him with a homemade bomb made out of MacGuyver's gum wrapper and a paper clip, It's really not news that she's wearing a leather dress. Unless.... it's human leather. Bwah-hah-hah. Just caption the picture with "Zoe-what's-her-name, at a premiere." 2-B. You know how I love my Trashy Mags, but the "Stars- they're just like us!" section is getting a little ridiculous with the latest entry: Audrina "Lipless" Patridge mixes mustard and ketchup. I don't know what to say. I mean, I guess that makes her more like me, but really, I never assumed she had someone to do that for her in the first place. Did she wake up and think, "I think I shall be like the nameless masses today and mix my ketchup and mustard. Then, I shall swallow my own water." What do you get the guy who gave you life, sacrificed so much to provide for you, threw you countless pop-ups in the backyard, gave you away at your wedding, provided medical care for your children, and battled Pancreatic Cancer in a war of epic proportions? Really, though, we bought my Dad David Copperfield tickets about a month ago for Father's Day. Even so, there's nothing more embarrassing than the three Dads in our family showing off their presents on the actual day. 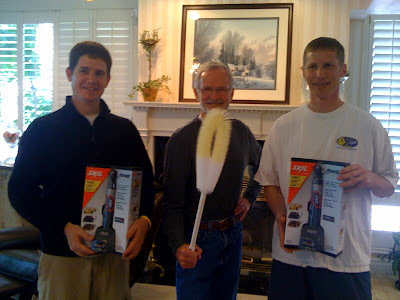 Sam and Dave with their cordless power drills, my Dad with his... backscratcher. My sister bought it from a travelling salesman, who I'm sure walked away from her house thinking to himself, "I can't believe she bought it. I've had that in my truck for twenty years. I wonder if she'll go for the dust bunnies in the back of my truck next time." After my dad opened the gift, my sister leaned over to me and said, "You owe me three dollars." Now I feel ready for the week. So, how was y'all's Father's Day? Anyone else care to contribute to things that must go? Things that must go: belly fat. Erin- Great defense. I don't know why I even blogged about it. As for belly fat, I agree. Who ever invented that stuff? Erin--it was a great toilet scrubber. Well done, wait, I meant to say 'back scratcher.' There you go Dennis, enjoy. The only thing more annoying than those types of voice mail prompts is the person that puts on his voicemail: 'Hello? (long pause so you actually think it is the person you are calling is there...and then; 'sorry, I am not in right now.' I had already started talking to him not realizing that it was just a recording. Yeah, that drives me bonkers. Sam- I think people stopped the practice of the answering machine 'fakeout' in the 80's. But I did see it recently- when I was watching a rerun of the first Terminator last week. So, if you are still getting the fakeout, tell your friends "That is soooo 1980." Zing. Father's day would have been better if you don't have to buy a gift for a Father-in-law that complains about your gift but won't let you return it to get him something else. I'll try to spare you my rant - he's always been like this. I think out of 100 gifts, he has like 5, even though we ALWAYS ask what he wants and get it or we get him something for his known favorite hobbies. Thank goodness my dad is easy to shop for and please! Things that must go - morning sickness and that pregnancy fatigue thing! I'm was too tired to read this weekend - I think I'm going through reading withdrawals! Brodi - that article about celebs being just like us reminds me of celeb twitter posts - both are absolutely pointless time wasters and not in the good way. well on the subject of things that must go....maybe your dad's father day gift?? LOL!! side note: we saw your dad today (eliza had a Ck. UP) he looks fab! we are so SO glad he is fab! we heart your dad! Una- ungrateful in-laws should definitely go. And take morning sickness with them. Dorien- Why do you think I added that gift to my list that must go? Seriously, it should be blown up or something! I love the things that must go. So with ya on the voicemail (or any phone tree for that matter). Things that must go: Kids staying up 2 hrs past their bed time. Debbie- how about we just say "kids awake at all". But Brodi, some kids are pretty cute and entertaining when they are awake. things that MUST GO--SLOW DRIVERS IN THE LEFT LANE!! Gives me heartburn and road rage! Alright so I'm imagining the worst thing ever would be sitting in a car, ranting to a friend on the phone about the person in front of you who is driving too slow to be in the left lane. Then telling them about the fact that you feel like crap because you are pregnant with a child who will "hopefully" be not be ugly or boring but will most likely stay up at least two hours past their bedtime. Plus the fact that once you deliver the baby you will have belly fat and stretch marks (I added the stretch marks since that is my contibution to the list). Then when you ask your friend why they are not talking to you, you realize that you just fell for the oldest trick in the book because you get a really annoying lady who tells you that your friend is not available and then gives you instructions on how to leave a message! And the whole time you were only trying to get to your dads house to give him a toilet cleaner..er um.. back scratcher that he is not going to like anyway! Wow, I'm stressed just thinking about it! I didn't realize that my profile doesn't have my name on it. I'm really cousin W, not 1 running girl. I should probably figure out how to change that! Cousin W, you need to comment more often! Miss you.